Hers probably next 2-3 months so nt much of a worry..
Actually the thing i'm nt sure is how they calculate. you see my scenario below..
- Got PR on 2nd Apr 13 and 1st contribution started in May. Total divided by 24 mths. I have missing mths income. Waiting for my AHG results.. 3 more weeks! Last edited by bearine; 05-07-2013 at 04:46 PM.. If based on past 12 months from 1st appt(2nd Aug)..Then is Aug 12 to July 13..
And she has like 3 months of non-income from Aug to Nov.. If taking this into account, very good chance of higher AHG.. But ur calculation got sala not?? Divided by 24months?? Hmmm, if my gf just started work last month, then my average lower already right since she only worked like 2 months from Aug 12 to July 13... Like tat can get higher AHG right? I asked the officer twice.. She says divided by 12 mths for each applicant.. Even mths with no income.. Hmmm.. Got to wait till my results out to confirm.. after all the one I called shld not be the one who approve it.. But for the missing mths, I need to produce my cert as I was studying..
Not based on 1st appt.. Based on bto mth.. They also make u sign an oath.. To say that the missing mths u got no income..
Last edited by bearine; 05-07-2013 at 05:08 PM..
Do update ur appt date here once u get it..
yays! appt on 29th july!! Better still. Her pay back then is lower.. So is mine before increment. Easier way to explain is applicant a + b total income excluding bonus and whatsnot(total for 12months) then divided by 12.that would be the average combined monthly income..
Last edited by Gixxerfied; 05-07-2013 at 07:18 PM..
Cant ans u until they reply me on my scenario. Means our q relatively slow..You 17th and on 29th, i 26 on 2nd aug.. IN A couple of years, Hougang residents will be able to watch a play, see a doctor and tuck in at a hawker centre, all within the same community club. The one-stop facility is believed to be the first in Singapore and will be completed by early 2015, according to Ang Mo Kio GRC Member of Parliament Yeo Guat Kwang. Asked whether the project would serve as a model for future community clubs, he replied that this had not been decided yet. He added: "But if we make it a success then, definitely, we may see more." The Government said in April that the Tampines Town Hub - to be ready in 2015 - will have a football field, a swimming pool, a library and a performing-arts centre. But Hougang is believed to be the first neighbourhood to house town facilities and a hawker centre within a community club. Mr Yeo said that putting the amenities under one roof would allow the club to become a "natural focus point" for the community. "It also makes it easier for residents to get all of the things they need (from) one area," he added. He said the plan came about after several government agencies realised they were all looking for sites in Hougang for their projects. The National Environment Agency wanted to build a new hawker centre there as part of the Government's pledge to build 10 by 2017, he said. 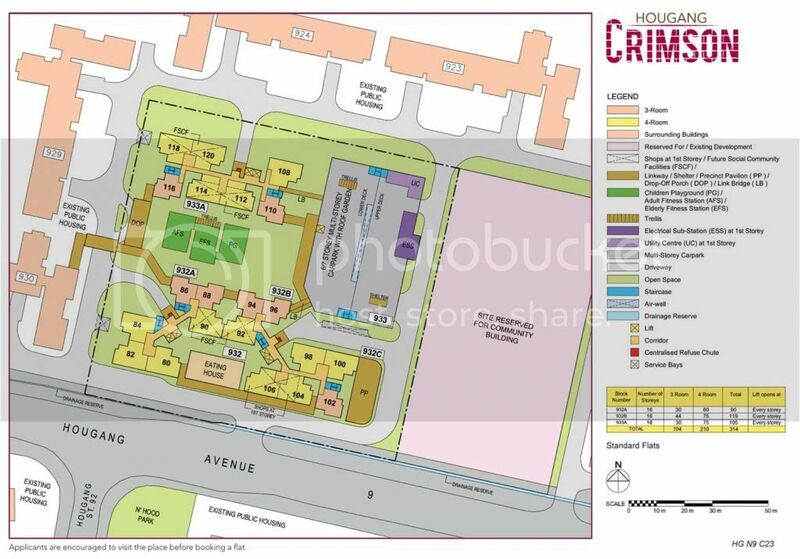 Anyone taking Hougang Crimson? Mind sharing which block you taking and why? Thank you.